Sure you can get bananas, condoms and surgical masks from vending machines in Tokyo, but there’s no need to lower yourself to coffee in a can (well, maybe just once). 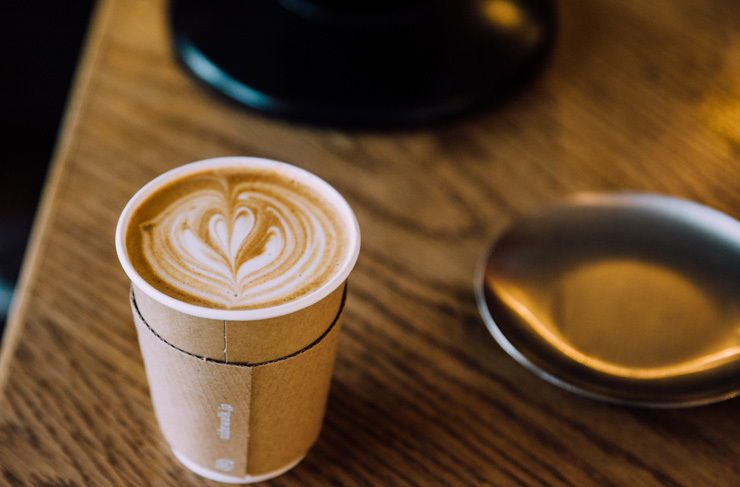 The truth is, Tokyo ain’t far behind Melbourne in the coffee stakes—finding a three-quarter latte or a good single origin isn’t as hard as you might think. The city’s coffee culture has been around for centuries, but in the last few years it’s really taken off. Thanks largely to a few canny ex-pats and young Japanese entrepreneurs. Exquisite design, attention to detail and A-Grade ingredients: Japan’s known for that stuff already. They just had to add a milk steamer. 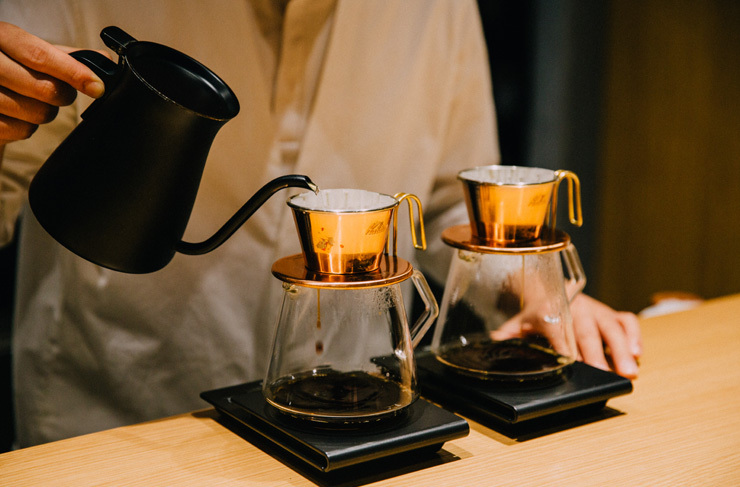 Here’s where to get good coffee in Tokyo. Day-um we loved this place. The staff are so lovely and the coffee is great. 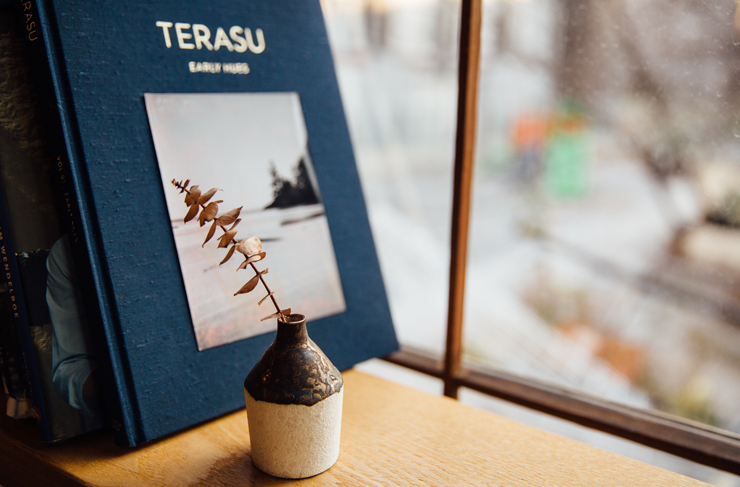 Onibus is owned by a guy called Atsushi Sakao, and he’s there all the time, roasting beans, bagging and weighing coffee, steaming the perfect flat white. In fact the Onibus model has become so successful that Sakao has opened a few around Tokyo. The store in Naka Meguro is a little old house, double storey. You order in the window downstairs: either a takeaway cup or a beautiful Japanese porcelain mug, (made specifically for Onibus). Our tip? Head upstairs to the beautiful little wooden space that overlooks the trains coming into the station. If the weather's nice there's some seating downstairs in their little garden too. These guys are actually an import, fresh from San Francisco in the US. They’ve got a few coffeehouses around Tokyo, including Aoyama and Shinjuku (on the south side of the train station). You’ll know you’ve found one when you see the blue bottle sign. They do a great brew, they’re serious about their craft and you can buy coffee-related stuff like filters, jugs, beans etc, if you want to grab something to take home. 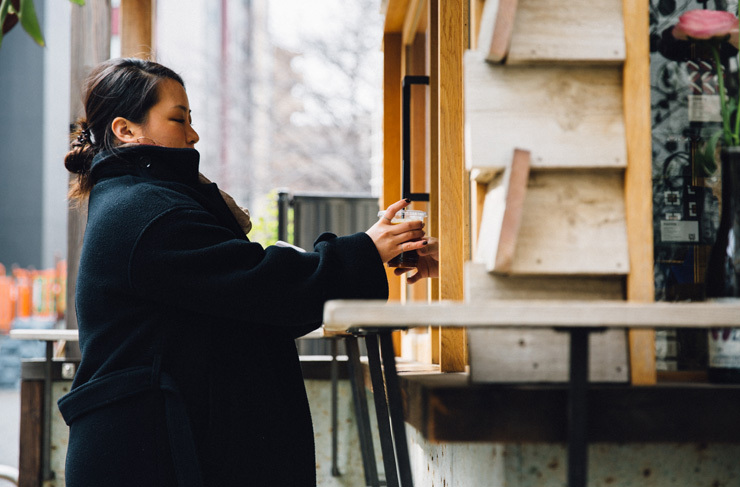 Their drip coffee is a specialty (the Shinjuku team crank out 700+ drip coffees each day). For nibbles, try the famous Egg Salad Sandwich topped with pickled carrot. City Bakery is the place you go when you just want a quick feed. And it's really really yummy. Right in the Naka Meguro station, it's one of those bakeries where you just grab a tray and a pair on tongs and load up on all the goods—best idea for your tummy, worst for your wallet. You can sit in and have a burger prepared fresh (for 500yen/$6), or falafel wrap with a coffee and they're seriously delicious. We came back a bunch of times on our recent trip. You’ll find City Bakery in a few spots around Tokyo, like Shinagawa and Hiroo. 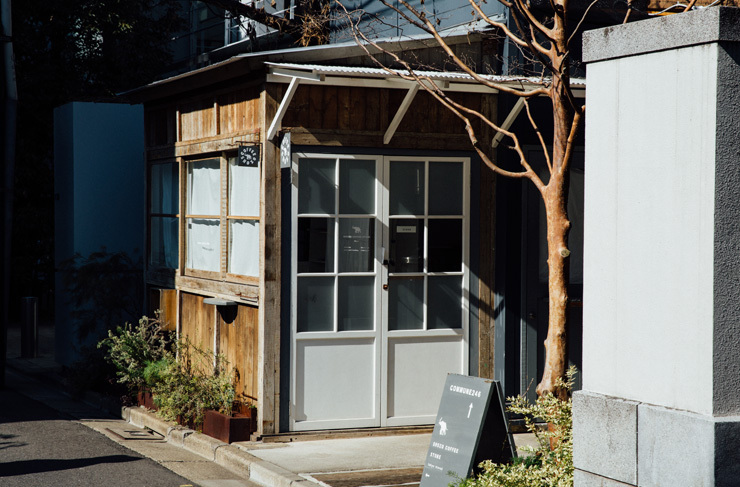 You’ll find Shozo right next to Onibus in Minami-Aoyama. It’s a tiny wooden hut dishing up high quality pour over coffee and a few little takeaway treats. The kind of place that makes you feel you’ve stumbled into a Miyazaki movie. If you’re a sucker for understated Japanese design, you’ll be all over it. The brand started up in Tochiki Prefecture just north of Tokyo back in 1988, but this is our favourite branch. The drip coffee goes down very easily, and there’s breads, biscuits, scones and other pastries for snacking. Make sure you check out the Commune 246 outdoor food market right next door. Amazingly, Cafe de l’Ambre has been keeping Ginza buzzing since 1948, when it opened up in the wake of WWII. The sign on the front door translates as ‘Coffee Only’, which is a pretty good guide. It’s still run by the original proprietor (Ichiro Sekiguchi, now 103), but the day-to-day running is handled by a slick and professional staff. Don’t expect mod minimalism here—the interior probably hasn’t been updated since the 80s, but that doesn’t bother the hundreds of hungry locals who pack in every day. There are usually 30+ single origins doing the rounds and an interesting mix of specialty aged coffees. English menus help out big time. Set next to the Sumida River, and build from warm stained timber, exposed ceilings and hanging pendant lights, From Afar is exactly what you’re hoping to find after a day trudging the Tokyo Streets. A little haven of warmth...that smells like strong espresso. The building is an old timber warehouse and practically oozes character. Your coffee comes served in a traditional Imariyaki cup, which is a nice touch. Whack on a seasonal fruit tart and you’ve found your new happy place. Settle down with a copy of Kafka On The Shore. Very cute, this one. You can sit on bar seats out front of Sidewalk, with a cherry-lined canal at your back, or you can pop upstairs, sit in the effortlessly Zen space and enjoy the view from up high. Sidewalk is great for a classic Australian style coffee and the toasties look amazing. It’s about a 10-minute walk from Nakameguro Station. Allpress beans (roasted in Koto Ward) produce a cracking coffee, and the sandwiches are all made from top-grade sourdough. Our pick? Try the Reuben and a double-shot latte. This one’s a Norwegian import—the first Fuglen cafe set up shop back in Norway. This one is half cafe, half cocktail, half vintage design boutique (seriously, you can buy pretty much everything in sight, even the furniture). Fuglen Tokyo opened up back in 2012 near Yoyogi Park. There’s no food during the day, just tea and very strong coffee. By night the place morphs and out come the Norwegian craft beers and Japanese cocktails from bartender Halvor Digernes. The décor could be Melbourne northside—plenty of vintage flourishes and some great little tables plonked out on the street. You won’t find drip coffee at Davide. They’re channelling the Italian streetside cafe feel, which means piping hot espresso, made fast and made to order, all served inside a quirky, pop-colour bar. The space actually extends over three levels—grab a latte to go on the ground floor, or hang around upstairs in the lounge. The basement opens up every now and then for pop-up events or visiting artist exhibitions. This place gets busy during commuter hour, so maybe wait till mid-morning if you’re after a chillaxing experience. Technically Monozuki is a Kissaten (a traditional tea house). It’s really hard to convey just how cool the décor is in here: stained glass windows, antiques and clocks all over the walls, mismatched hanging lamps and light shades, and more timber than the inside of a cuckoo clock. Plain black coffee is the name of the game here (don’t come in and order a flat white—you’ll look a right nob). Just enjoy Monozuki for what it is: a little slice of a bygone era. You’ll spot it from the outside easily enough; it’s next door to a super cute florist and features a big wrought iron balcony on the second level.